We often see similar questions throughout the vegan Disney community. We have answered some of them here. I have allergies and am looking for specific items to avoid, how can I get that info? We understand that avoiding certain foods can make dining a bit harder. Given that we are not a gluten free or soy free blog we often don’t ask about these things. However we have a great resource in our friend Sarah from Gluten Free & Dairy Free at WDW. She has a whole page on her blog with allergy menus all over, you can find that here. Yes, as long as you get the pineapple or orange flavor. The vanilla flavor is not vegan. You can find Dole Whips at both Aloha Isle in the Magic Kingdom and Pineapple Lanai at the Polynesian Resort, Pop Century and Disney Springs. Additionally the Pineapple Whip Soft-Serve from Tamu Tamu in Animal Kingdom is vegan. The Orange Cream from Sunshine Tree Terrace at Magic Kingdom is vegan without the vanilla swirl. The Peter Pan Float from Storybook Treats in Magic Kingdom is a Lime Dole Soft Serve and is vegan when ordering without the chocolate feather. Yes, all of the Disney ‘buttered’ popcorn fresh from the carts are vegan. They use an artificial dairy free butter flavoring for the popcorn. The Maple-Flavored popcorn from Canada in Epcot and Frontierland in Magic Kingdom is also vegan. Are pretzels in Disney vegan? Yes they are, Mickey shaped pretzels found throughout the parks and the salted ones in the Germany pavilion. Where can I find vegan ice cream? Many locations offer Tofutti and Rice Dream frozen desserts, including: Plaza Ice Cream Parlor in the Magic Kingdom, Dino-Bites in Animal Kingdom, the Hollywood Scoops in Hollywood Studios, and Beaches and Cream Soda Shop at The Beach Club Resort, as well as many table service locations. Vegan sorbet can be found at L’Artisan des Glaces in Epcot and also available at many locations throughout the parks and resorts. Please note when ordering Tofutti/Rice Dream it may take a moment or two longer to be served, as those items are scoops separately (sometimes in the back) to avoid cross-contamination. 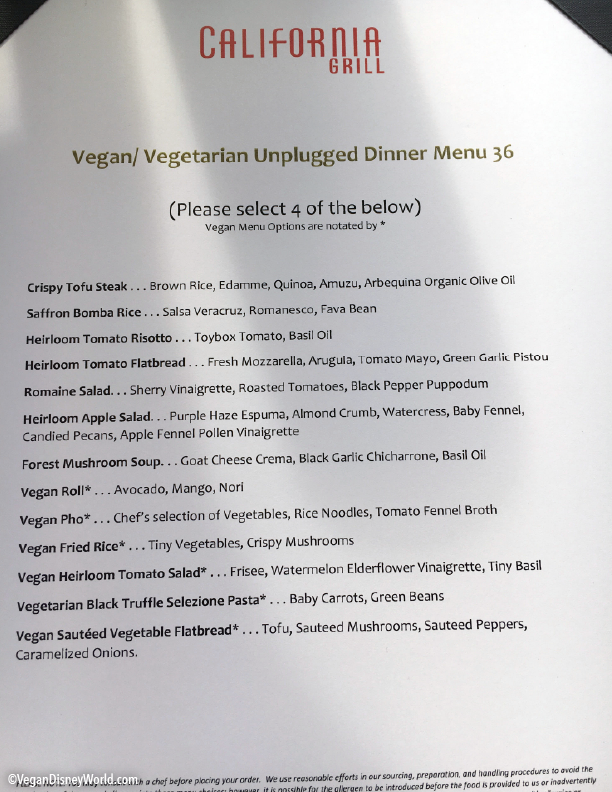 Is the Disney Dining Plan worth it as a vegan? It depends, if you are planning on doing lots of character meals then yes. If you are planning on avoiding buffets and character meals then no. 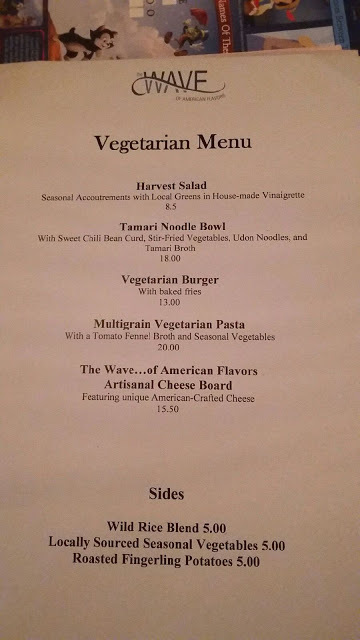 Typically the vegetarian meal on the menu is a few dollars less than the other entrees. Additionally, with the Magic Your Way Package Plus Dining, you get a dessert with a table service meal and most restaurants do not offer vegan desserts so you get stuck with either fruit or Enjoy Life cookies. This Disney Dining Plan Calculator is a great tool to decide if the dining plan is good for you. Who do I tell that I am vegan when ordering? If you are at a quick service, tell the cast member who is at the register. From here they will either give you an allergy binder or have a chef come out to help you. If you are at a table service, let the host know and they will mark it on your reservation card. Once you are seated remind the server and depending on where you are dining a chef will come out to speak to you or there is already a vegan item on the menu. Are there any restaurants with completely vegan menus? Yes! 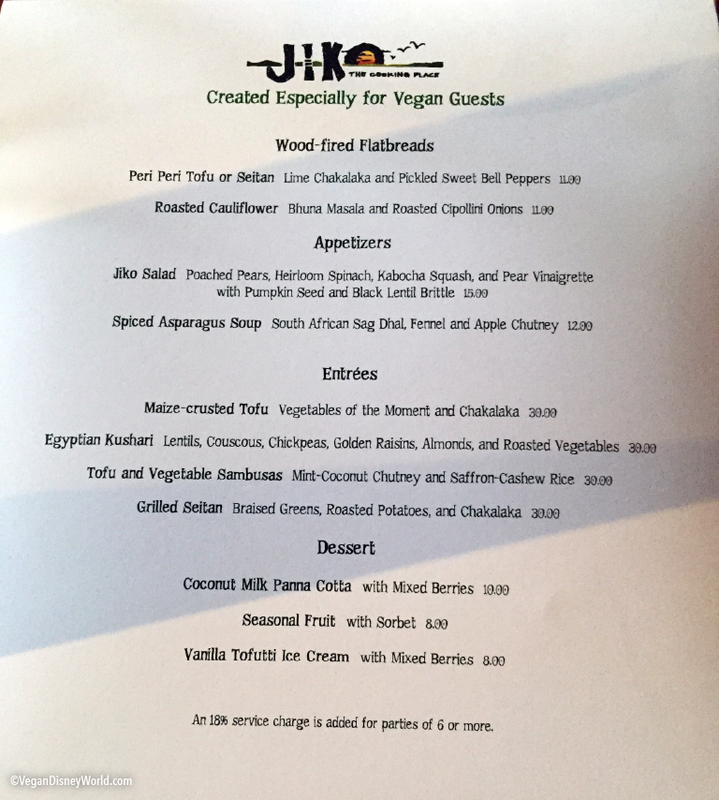 The restaurants that have them have changed over the years, currently we know of vegan and vegetarian menus at Jiko, California Grill, The Wave, Gasparilla Island Grill, Flying Fish, and Narcoossees. What’s the deal with allergy menus? During the Spring of 2015, Disneyland and Disney World parks and resorts began rolling out allergy menus at select table and quick service restaurants. The goal of these menus is to make it easier for folks who have common food allergies, such as peanuts, tree nuts, soy, gluten/wheat, milk, egg and fish. Allergy menus can be helpful for vegans in determining if a meal contains milk and/or egg. However, these menus will not list other animal products or bi-products such as honey or gelatin. Guests will always have the option of consulting with a chef, whether they are using an allergy menu or not. If you want to see some menus, check Gluten Free & Dairy Free at WDW here. Are all of the veggie burgers vegan? Previously our answer to this was no, however recently Disney World has changed many of the veggie burgers to actually be Beyond Meat Beyond Burgers which are vegan AND gluten free, additionally the Impossible Burger has been working its way around too. Be sure you ask what the patty is when you order, if it is the standard veggie burger it is not vegan and they often have Gardenburger Malibu burger available which are vegan. Always double check the bun when you are ordering, some contain honey. Where can I find the Beyond Burger? All Disney resorts offer a small store with items like loaves of bread, fruit, single serve soy milk, peanut butter and more. If you are looking for more check out our post about how to get groceries for your trip with Amazon Prime Now here. We know others have also used Instacart to get food to their resort. What about Universal Orlando and Island’s of Adventure? We’re not Universal pro’s, but luckily we know who are! Our friends over in the Universal Orlando Vegans Facebook group have created a great resource for finding vegan options in Universal. 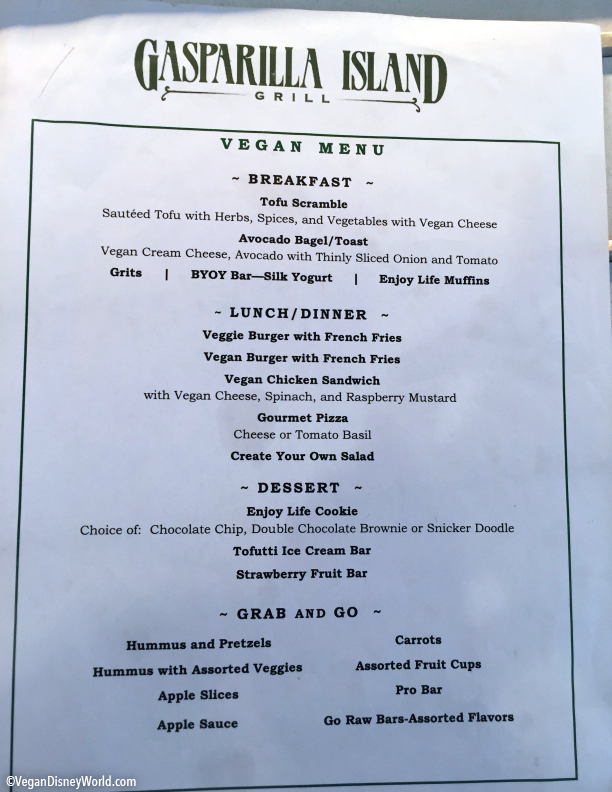 What was once a hard place for vegans has become super vegan friendly since fall of 2018 with the addition to vegan burgers and chickn sandwiches in the parks. Find the full list here. Who is paying for your meals that you review? Hi! I’m so grateful for this blog! Coming from the UK I was scared I’d come such a long way and starve for 2 weeks haha. My question is which table service restaurants you’d definitely make a reservation for on a trip for vegans – ones not to miss! We’ve already booked Tusker House and Sanaa. Hi! Do you know about Nine Dragons in Epcot? I have heard from friends that they have had the tofu and vegetables, spring rolls, and other things, but did not find them on this website and wanted to make sure. Thanks! Hi there! We have had really mixed reviews and feelings towards Nine Dragons. We have heard they are actually vegan friendly now, we are just hesitant to put them on here as their “vegetarian” things used to contain chicken broth, which makes us nervous. Hi, I’m leaving for WDW soon for the first time and I managed to get a breakfast at Cinderella Royal table… I haven’t seen any good vegan option on the menu but I really want to have this experience and eat since it is quite pricy, is it easy to get a special plate there? Hi there! I’m planning a trip to Disney for October and was wondering if you had any insight about when to book a dinner at Fort Wilderness… I definitely want to go when Chef TJ is working but wasn’t sure if you knew whether or not he was there on particular nights. Thanks so much! Your website and podcast have been so helpful while planning this trip! Im going to Blizzard Beach in two weeks, any advice for eating vegan there? The cooling hut in Blizzard Beach had a Red Pepper Hummus and Vegetables when we went in May 2016, also a fresh fruit cup. Their system didn’t seem set up to use these items as a QS meal credit for me but they managed it eventually! Hello I am planning a trip to Disney World and researching vegan selections. I am having a hard time finding vegan selections at the two water parks on site. Do you have any reviews or advice for eating while at the water parks? Do you have any advice for vegans taking a day off from Disney to visit Universal? The last time I was there I was incredibly disappointed and couldn’t find much of anything to eat. Hey Zoe, it seems like Universal still isn’t that great for vegans. We’ve heard that Mythos at IoA has been able to frequently accommodate vegans. There is lots of fresh fruit available in the parks, but seems like there isn’t much for a quick service option. Universals whole take on special diets is to bring your own food. If you have a car there is a Whole Foods across from the Universal Area, on Turkey Lake Road, that has a great hot bar, and I highly recommend going down to Ethos Vegan Kitchen in Winter Park if you’re already up near Universal. When I was last at Universal Studios Hollywood, there was almost nothing to eat, I think I found some plain chips and ornage juice in the mall portion outside the main gate.